Two NASA moon probes will end their gravity-mapping mission in spectacular fashion Monday (Dec. 17), crashing intentionally into a cliff near the lunar north pole. The twin Grail spacecraft, known as Ebb and Flow, will slam into the raised rim of a moon crater at 5:28 p.m. EST (2258 GMT) Monday, mission team members said today (Dec. 13). The probes will impact about 20 seconds apart, with each traveling at 3,760 mph (6,050 kph) or so. The crash zone is far from any area where previous moon missions — such as NASA's Apollo efforts — touched down, so Grail's final moments won't endanger sites of historical importance, officials said. The $496 million Grail mission — short for Gravity Recovery and Interior Laboratory — launched in September 2011, and Ebb and Flow arrived in lunar orbit about three months later. The two probes have been zipping around the moon ever since, mapping its gravity field in unprecedented detail. 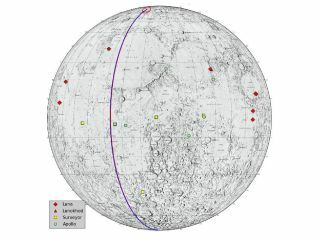 That map has revealed an incredibly pulverized lunar crust, she added, suggesting that the moon, Earth, Mars, Mercury and Venus were pounded by long-ago impacts far more violently than previously thought. Grail's primary science mission ran from March to May, during which the spacecraft zipped around the moon at an average altitude of 34 miles (55 kilometers). Ebb and Flow dropped down to about 14 miles (23 km) for an extended phase, which wraps up in the next few days and should make the gravity map even better. "This is all according to plan," Zuber said. On Friday morning (Dec. 14), mission managers will turn off Ebb and Flow's science instruments and order a maneuver that puts the probes on course for the rim of the crater, which sits at a latitude of 75.62 degrees north and a longitude of 26.63 degrees east. On Monday, the low-flying spacecraft will hit the wall of rock head-on, at an angle of just 1 degree or so above the horizontal. The spacecraft will blast out small holes in the rim but leave little of themselves behind. "They're going to be completely blown apart at the time," said Grail mission manager David Lehman of NASA's Jet Propulsion Laboratory in Pasadena, Calif. The violent demise of Ebb and Flow should provide mission scientists with some information about the mechanical properties of the crater rim, perhaps shedding further light on lunar composition. It's also possible that the probes' impact will expel water ice or other volatiles into the wispy lunar atmosphere, where they can be detected by NASA's Lunar Reconnaissance Orbiter. Indeed, LRO has been studying the crash site and will attempt to do so again during and after the impact, researchers said. But the Grail team doesn't necessarily expect to see ice. The crater rim is in sunlight much of the time, and the spacecraft just aren't big enough to kick up much ejecta. And skywatchers shouldn't get their hopes up for a view of the impact from their backyards. Ebb and Flow are "washer-and-dryer-size spacecraft with empty fuel tanks," Zuber said. "So we're not expecting a flash that is visible from Earth."